Is it just me, or does something always fall through the cracks this time of year? With a full-blown case of new-mom brain, I’ve been trying to be extra diligent this year. I have a ton of lists and have been double-checking them. I’ve got baking plans. I ordered Christmas cards in November. I’ve got all our gifts laid out on the dining room table, sorted by what day we’ll be seeing people. Sounds like I’ve got my stuff together, right? I thought so, too. 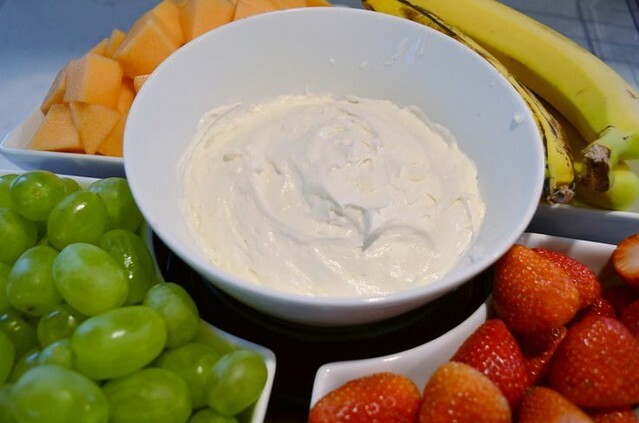 I was patting myself on the back Saturday evening for having my food contributions for Sunday’s family party altogether – this dip already made and all the stuff for a salad ready to go in the fridge. I was upstairs rocking the baby when Mark came up with a panicked look on his face – and a reminder I’d left on the end table to order a pretzel tray for the party. My Mom had volunteered to bring it – but it was on us to order it. And my reminder had gotten buried under mail and other papers. Guess who was scrambling to order a pretzel tray the night before the party? This girl. At least I had my own stuff together. With any luck, that’s the only thing I’ll forget this week. Toss the cream cheese, marshmallow creme and vanilla in a stand mixer and beat until smooth. Serve with fruit.